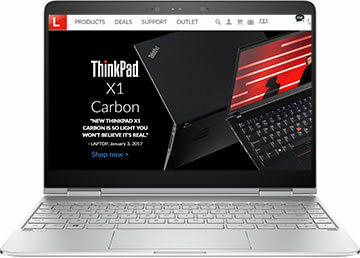 Lenovo coupons and promo codes are collected and shown here, to help you get a great deal on a ThinkPad laptop, Yoga tablet, ThinkCentre desktop, AIO all-in-one, Moto smartphone, or other product. We update this page constantly and offers change all the time, so check back often to find the best Lenovo promotional codes and special sales. IBM invented the personal computer, so it came as a surprise to many people in 2005 when a relatively unknown (in America) Chinese company acquired the IBM Personal Computing Division. However, Lenovo appears to be a success, with innovative personal computer products that can be ordered online at Lenovo.com. They’ve continued to build and advance top IBM brands like ThinkPad and ThinkCentre. They also make storage products formerly made by Iomega with the LenovoEMC venture with Dell EMC. Iomega grew to prominence with their ubiquitous zip drives in the 1990s, but these days they make items network attached storage (NAS) devices and have dropped the Iomega brand name. Lenovo.com offers a wide selection of laptop PCs, from lightweight ultrabooks and 2-in-1 convertible notebooks to robust business laptops and rugged mobile workstations. They even have powerful gaming laptops. Popular brands include Thinkpad, Ideapad, Legion, Flex, and Yoga.